JERC Recruitment 2018 Notice for inviting applications for the post of Principal Private Secretary and Private Secretary in JERC. ICAR Recruitment 2017 Latest RA SRF Jobs in Indian Council of Agricultural Research ICAR SRF Recruitment 2017. VECC Recruitment 2018 Government strives to have a workforce with Stipendiary Trainee reflects gender balance and women. To Apply Online read Below articles. National Institute of Miners’ Health wants to fill Research Associate, JRF, SRF and Research Scientist in the prescribed format to the address given. SEBI Recruitment 2017 Latest Jobs For Graduate in Securities Exchange Board SEBI Upcoming Recruitment 2017. PNB ATM Withdrawal Limit is set to 5 Free ATM transactions from October months to all Debit, Credit Card Holders. OPTO Electronics Factory Dehradun Recruitment 2018 It is to inform that 04 vacancies of LDC for direct recruitment notified in Advertisement. CGHS Book Online Appointment For Beneficiaries who want From Home Registration, They Can generate OTP Number at www.cghs.nic.in. Central Pulp & Paper Research institute invited application for section officer recruitment in CPPRI. To apply online below given procedure. 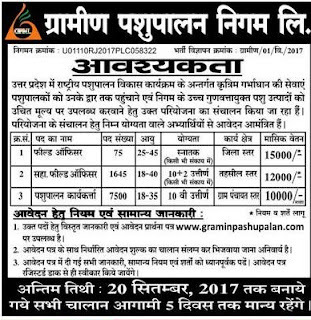 UP Pashupalan Vibhag Recruitment 2017 Upcoming Jobs in Animal Husbandry, Health Worker, UP Pashupalan Vibhag Latest Recruitment 2017.